Philip, thanks for an interesting ride. Quiet and hitherto unknown sites, practically on my doorstep. Pleasant weather and pleasant company, excellent. On Sunday I shall wear yellow. Is this becoming a trend? Here’s a second poetic effort – this time from the blog of OnYerBicycle – encouraging us to celebrate Bradley Wiggins on Sunday. A greatly amusing piece – based on Jenny Joseph’s “When I am an old woman I shall wear purple …” – from Kevin Mayne’s blog “I Do Not Despair” urging all cyclists to wear yellow on Sunday in anticipation of Bradley Wiggins’s triumph! 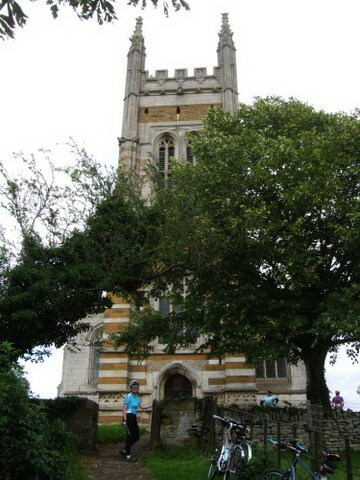 This Saturday afternoon, CTC Northampton invites you to join a short cycle tour of some Parish churches to the south-east of Northampton, the second in our Summer of Cycling Leisure Series rides. Depending on time and access, we will visit two or three of the following churches. Whiston is said to be one of the most interesting churches in Northamptonshire, little changed since 1534 and still without electric light. In Denton there are murals by celebrated Northampton artist Henry Bird. Preston Deanery is a small, very old church now cared for by the Historic Churches Conservation Trust. And finally Great Houghton is unusual in this county in having a Baroque exterior. After our tour of spiritual places we will enjoy some temporal relaxation at the Britannia pub. So, if you can bear not to watch Brad Wiggins in the final Tour de France time trial, please come out and enjoy fresh air and a hint of the eternal with us. We start from the Whitewater Centre, Bedford Road at 2.00 p.m. and should return by 5.00 p.m. The ride will be 15 – 18 miles at a leisurely pace. There are some hills but we will take them easy. The weather forecast is currently for sunny intervals and up to 19 degrees (you may wish to retrieve your suncream from wherever you left it last summer…). Non-members are welcome but please contact me first (01604 720522 or chairman@ctc-northampton.org.uk) if you have not ridden with us before. Sunday 15th July seemed to be a popular day for cyclist around the county. Unfortunately, however, not from the Northampton group – I thought it might be a solo ride for me. Luckily Eleanor arrived and cycled as far as the coffee stop which should have been at Woodford Halse. Mindy’s cafe was closed so Eleanor returned to Canons Ashby whilst I continued to Napton to join Bill for lunch. Shortly after Boddington (close to the future HS2 rail link) the single track road sported signs of a cycle route with marshals. This was the Napton cycle festival ride and I was told that about 150 people had entered. In the next 3 miles into Napton I met those 150 cyclists going the other way !! The Just So Café (www.cakesjustso.co.uk ) is cycle friendly and suitably refreshed Bill and I returned via Priors Marston meeting more cyclists in the other direction completing their ride . Although cool for the time of year the weather was good for cycling and we stopped for tea and cake at Litchborough church, sitting in the sun outside along with other riders. A longish ride covering some quiet country lanes which perhaps we can repeat some time. My ride started with a coffee at the Wetherspoons in Leatherhead. It was 20 days before the men’s Olympic road race. I was in Surrey for a school reunion, so decided to check out the circuit. Leatherhead was chosen being the closest part of the route to the M25, and easiest to access. I had used the Wetherspoons and adjacent Swan Centre car park only weeks before, prior to the funeral of a cousin at the nearby crematorium. My great-nephew James was to join me on the ride, hence the need to meet up for coffee before the ride. We would follow the route, as will the riders, in an anti-clockwise direction. Leatherhead is situated shortly after the Box Hill circuit, so marks the final part of the race back to the finish in the Mall in London. We soon noticed the yellow signs along the route warning “No Stopping 28-29 July Tow-away Zone”. Useful when we later noticed a different date – so we were off-course! We soon crossed over the M25 and joined the A244 through Oxshott, and under the A3 to Esher. Riders would be protected from side winds by the high walls and hedges of the expensive Surrey houses lining the roads. The A307 led to the A309 at Thames Ditton, where yellow paint highlighted intended repairs to the gaps in the expansion joints of the original concrete sections; but there were no marks at other highways surface lumps and faults! The Thames was crossed as we passed Hampton Court Palace on a section the riders would have used as they left London earlier in the day. After negotiating the one-way system at Kingston-upon-Thames, we turned left at the Albert pub onto the narrower Queens Road that leads to Richmond Park. This looked to be a newly surfaced section of road and very welcome. The peloton would have to narrow and split to pass through the Kingston Gate to enter Richmond Park. Suddenly we began to see other cyclists. After 2 miles of delightful tarmac through the parkland we turned by the Richmond Gate to ride another 2 miles in the direction of Roehampton Gate, and the finish in London. At the top of Sawyers Hill we could see the City, and The Shard – London’s answer to Le Tour Eiffel in Paris. The Park’s residents lined the roadside here; would the deer be a hazard to the riders on July 29th? The Olympic riders would exit Roehampton Gate onto the streets of South West London, without any concerns for other traffic or traffic lights, to finish in The Mall. We preferred to avoid the worst of London’s traffic so took a different approach, stopping for cakes and coffee at the Roehampton Gate Cafe! Other cyclists were also using the facilities, and there was an adjacent cycle hire centre for Londoners wanting a pleasant potter in the Park. We retraced the parkland route to the Richmond Gate, where the riders would enjoy their first part of rural scenery after the streets of London. The riders would not be troubled by the 30mph speed limits in town, but the 20mph limits in the parks would certainly be ignored! A left turn down the Star & Garter Hill is followed by a sharp right through the traffic lights onto Petersham Road alongside the Thames. This is a high-risk turning for riders. After passing the poppy factory at the back of the Star & Garter home, they will cross Richmond Bridge to pass Twickenham and Teddington to reach Bushy Park. Here is another mile of welcome tree-lined parkland with the Diana (not that one!) Fountain creating a roundabout to be negotiated with care. Riders turn right at the Liongate exit to cross the Thames by Hampton Court, then westwards passing London’s reservoirs to Walton-on-Thames. This was to be our lunch-stop. The Olympic route conveniently passes The Regent, a J.D.Wetherspoons! Not only useful for refreshment, but also for toilet stops; not many opportunities in suburban London! More suburban roads take riders through Weybridge, past Brooklands racetrack to Byfleet. At West Byfleet the course starts to become rural with views of the 12th century Newark Priory beside the River Wey at Pyrford. After Ripley the unclassified narrow rural road crosses over the A3 and continues straight ahead for 3 miles, with a climb beginning at West Horsley. The gentle climb on the A246 continues to East Clandon, where riders turn left and continue climbing on the narrow unclassified Staple Lane. Highway repairs were still underway here, with cones left in the unlit road! If the riders have time to look over their left shoulders after a mile of climbing, they will see The Shard on the skyline! But they need maximum attention for the descent: A short single-arrow downhill suddenly turns right on a hairpin – very dangerous if wet, and it is under trees. My map already carried a handwritten note from a previous scare! The danger continues as riders will hit 40 mph on an uncertain surface before a sharp left onto the single-carriageway A25. Will the road be wide enough to avoid a big pile-up? The A25 bypasses picturesque Shere, but after snaking under the rail line at Gomshall, riders will pass under the famous clock at Abinger Hammer. Will the riders notice its motto “By me you know how fast to go” as Jack the Blacksmith strikes the bell on the hour? My partner for the ride, James, began to suffer as the main road becomes quite lumpy on its way to Westcott and Dorking. Not surprising as his longest previous ride of 45 miles was exceeded. We turned North onto the cycle-path alongside the busy A24 dual-carriageway at Dorking. Will the Continental riders be tempted to stop at Denbies Vineyard, England’s largest, before they reach Box Hill? Maybe a roadside table of freshly poured bubbly would temp them! Their rosé won Best in the World last year. I’m looking forward to a wedding reception there next summer. The cyclists’ underpass saved us negotiating the busy dual-carriageway roundabout to access Box Hill. Before the climb we stopped at the “Bykas” Cafe for much-needed refreshment. Our choice wasn’t yet subject to the draconian rules to favour Olympic sponsors – so I was able to have a simple cuppa! 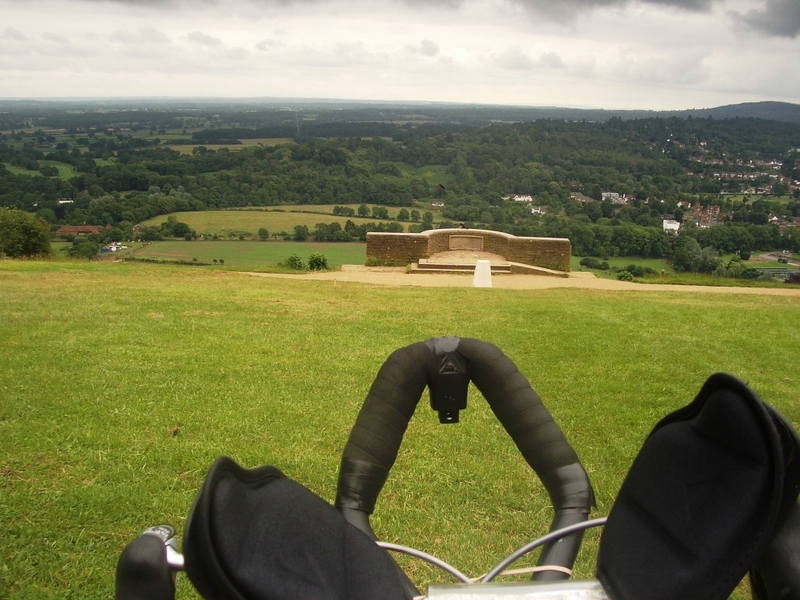 So what of the Box Hill circuit? The “Zig Zag Road” rises for 2 miles on a billiard-table-smooth newly laid tarmac surface. But the gradient is very gentle, so no benefit to pure climbers. Power climbers may manage 3 or 4 ascents, but 9 will probably be too many. So we hope that World Champion and TdF stage winner, Cavendish, supported by fellow TdF stage winners Miller, Wiggins & Froome, will still be in with a chance after 9 circuits of this 9.7 mile circuit. Once over the top, tourists will stop to visit the viewing point over the Mole Valley to the Surrey Hills. The Olympic riders will continue past the Cycles Dauphin shop, turning sharp left on the B2033 towards Leatherhead. The surface here is not the best, and quite lumpy, before dropping down to the A24. The riders will then leave the main road, passing through Mickleham on the Old London Road, to reach the bottom of the Zig Zag Road. After the final loop of Box Hill the riders will head for Leatherhead, passing through the town centre and onwards to the London finish on the route we had taken earlier in the day. James and I had covered a mere 64 miles by cutting out the London – Roehampton section and limiting Box Hill to a single circuit. We returned to the Wetherspoons to meet up with family, and enjoy final refreshment. At the bar I was accosted by another customer; “You get about a bit, don’t you!” “I beg your pardon?” I replied. “Weren’t you in the Wetherspoons at Walton-upon-Thames at lunchtime? Are you doing a Tour of the Wetherspoons?” said he. Well I had visited the only two of their pubs on the route of the Olympic Road Race!